You probably assume that most people working at an art museum are pretty into art, but what you might not realize is how many of them are artists themselves. A trip to SAM’s community gallery to see the SAM Staff Art Show, on view through February 3, is a great reminder of the talent that fills not just the galleries of our museums, but the administrative offices as well. Make sure to walk all the way to the end of the first-floor corridor to see the work that won our hearts and the most votes during the Staff Art Show reception. 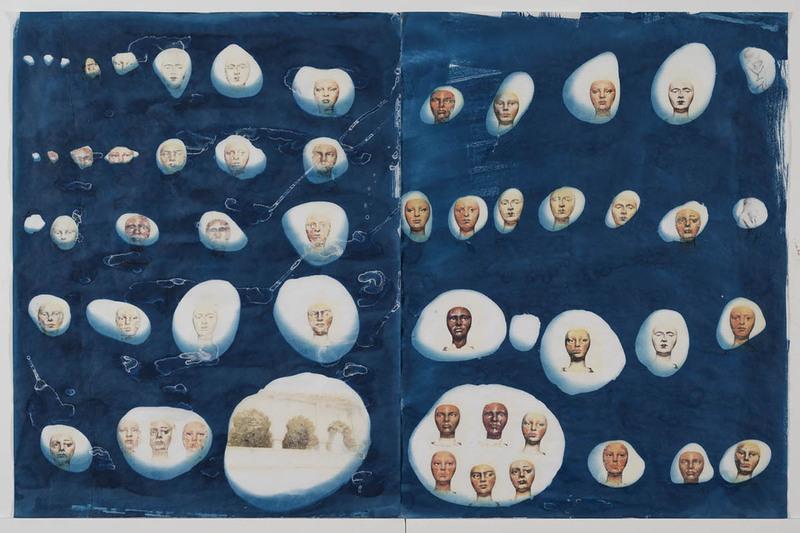 What you’re looking for is an indigo diptych by Lynda Harwood Swenson. Her piece, Sticks and Stones 1 & 2 (Lapidation), contains a lot of tension while also feeling calm and contemplative. Give it a good long look the next time you visit. Lynda is the Art Studio Programs Senior Associate at SAM. She’s the mastermind behind our free Drop-In Studio events on First ThursdayS and summer Sundays and the interactive art-making activities that SAM offers through our education and public programs. She also recently became a member of Shift Gallery in Pioneer Square where you can see her work in a solo show February 7 through March 2. SAM: When did you begin making art formally? Were you always working in print media? How did you arrive at it? Lynda Swenson: I was lucky that I went to a high school that really valued art and art making and my art teacher in high school was a printmaker. She introduced me to the medium and I really fell in love with it and continued working in printmaking through college and most of my adult life. The title of this piece brings a lot of context to the work about both the topic and materials. Can you expand a bit on the meanings you are playing with? In choosing the title, Sticks and Stones 1 and 2 (Lapidation), I was thinking about all the negative rhetoric directed at women in the last few years. Because the image is a photogram of stones, I thought it was a really simple way of telling the viewer what they were looking at, as well as what my intention was. Adding the word “lapidation,” which means stoning a person to death, where no individual is held responsible—is suggesting an awareness that this is still happening in places and, metaphorically, it happens in our society all the time. You said the women in this work are not based on actual people, how did you decide to depict them? The women’s heads in the work are from a found image from a magazine, I think they were carved wooden heads (I don’t know who the artist is). I manipulated them through a copying process and then the transfer process. I really wanted to depict women from many ethnic backgrounds, even subtle skin color differences mattered in the work. How are the white lines and shapes created? Are these traces of your process? The white lines are part of the cyanotype process, they are a byproduct that is sometimes left behind on the paper, or in this case on the vellum, it may be from minerals in the water used to rinse the chemistry out after exposure. The stones that you used in this work, are these actual stones? Where did they come from? Yes, the stones are real and were from my yard. They were laid very neatly on vellum sheets that were covered in a cyanotype chemistry and exposed to light—the white parts of the image are where the rocks laid and the blue is where the chemistry was exposed to the sunlight. Tell us about Shift Gallery, the artist-run gallery you joined this year. This is currently the 15 year anniversary of Shift Gallery. It’s an artist-run space in the Tashiro Kaplan building on 4th Avenue and Washington Street, near Pioneer Square. Shift is a great venue with a mission of supporting Northwest artists of diverse media and rigorous content. 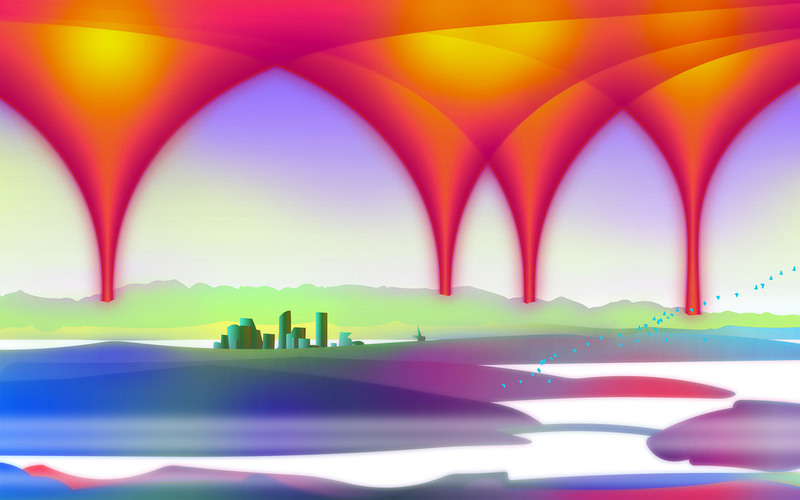 I feel like it’s a great launching pad for Seattle artists to show their work. What else are you working on right now? Where else can people interact with your work? I have a solo show opening on February 7 at Shift, running through March 2. I also have work on view at the Coos Art Museum, in the West Coast Ink and Print show in Coos Bay Oregon until February 9. This etching, Mending the Tears, by Winslow Homer is often celebrated for its quiet dignity, beauty, and composition. Scholars look to, for example, “the strong but simple modeling of the two girls, the boldness of their silhouettes against the misty background, and the play of the erect girl’s posture against that of the bent-over mender,” and “the relaxed crossing of feet or the curl of hair casually freeing itself from the formality of a bun,” as examples of Homer’s mastery. 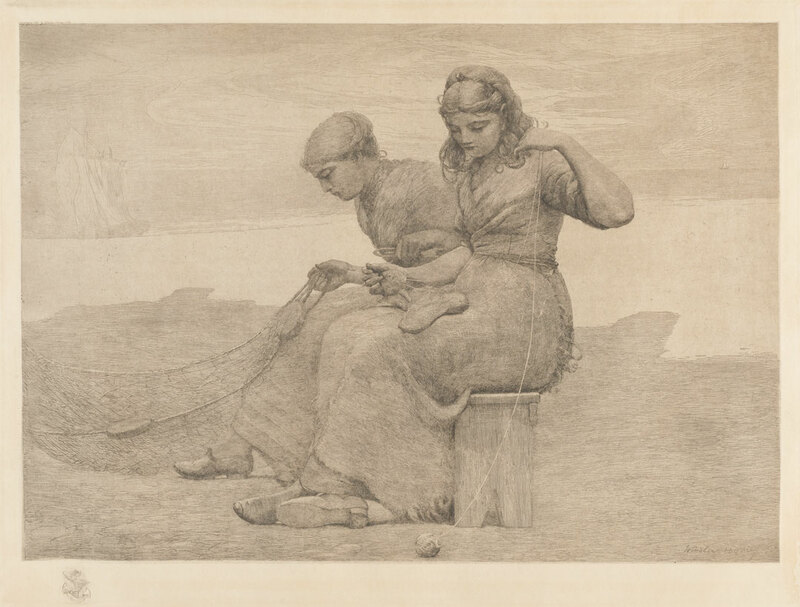 Homer is rightly renowned for his contributions to American painting and printmaking, but less addressed in the scholarship surrounding this work are the actions of the depicted women—mending a net and darning a sock—from which the title bears its name. Once we consider the date of Mending the Tears, made during the middle of the women’s suffrage movement in 1888, this romanticized image of women doing domestic work takes on different meaning. The women’s suffrage movement, which began in 1848 in Seneca Falls, New York, is inextricable from the history of women’s labor in the United States. At the time, many working class women, enduring 14-hour shifts in garment factories and textile mills, would participate in the kind of work pictured in Mending the Tears, albeit on a much larger scale and in less picturesque settings. However, as early as 1844, women activists were speaking out against the working conditions of these workplaces: women working in the textile mills of Lowell, Massachusetts formed the Lowell Female Labor Reform Association (LFLRA); in 1866, shoe stitchers formed the first national women’s labor union, the Daughters of St. Crispin; and, that same year, newly freed black women in Jackson, Mississippi also formed a union demanding higher wages, The Washerwomen of Jackson. The list of such accomplishments, driven by women workers across the country, goes on. The labor movement was largely inspired by the republican values of a just society, social equality, and virtuous labor, as well as the socialist theories of David Ricardo. Mending the Tears, based on a watercolor made by Homer in 1882 while in England, beautifully captures one version of 19th-century life—and the role of women within it—but it is an idyllic one, and one at odds with much of the social and political changes taking place in the United States during the late 19th century. Philip C. Beam, Winslow Homer at Prouts Neck (Lanham, Maryland: Down East Books, 1966), 58; Doug Gruse, “‘Impressions’ of a master,” The Post-Star, October 5, 2008. Images: Mending the Tears, 1888, Winslow Homer, etching, 17 3/4 x 22 7/8 in., Josephine and Windsor Utley Purchase Fund, 98.21. Photograph by Lewis Hine. Women strikers in the early 19th century. This is it, people. Less than a week left to get your fill of Graphic Masters: Dürer, Rembrandt, Hogarth, Goya, Picasso, R. Crumb before it closes August 28. In this, the last week of our groundbreaking summer exhibition, we deliver our final crash course in printmaking with a quick introduction to woodcut. Get up close and personal with the rich history of woodcut prints by viewing Albrecht Dürer through the magnifying glasses provided in the Graphic Masters galleries. With more than 400 artworks by six artists, you’ll want to give yourself plenty of time to soak up the details during your visit to SAM. Dating back to the 14th century, woodcut was the first process developed in Europe for printing on paper. Woodcuts are a relief process —the artist makes a drawing on the block and chisels everything else away, leaving the raised lines on the surface intact. 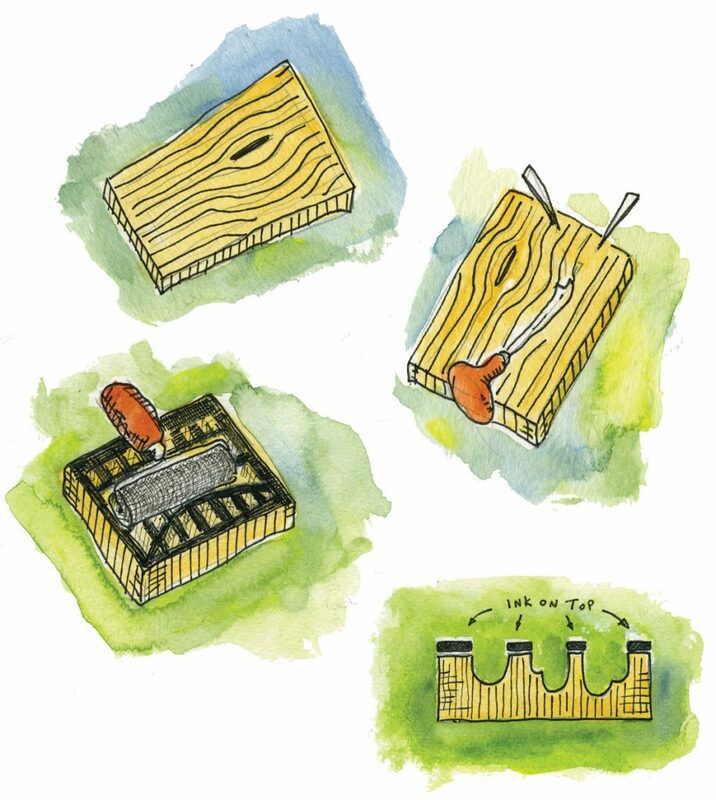 Before printing, a uniform layer of ink is rolled onto the wood block surface using a brayer. Woodcuts are characterized by crisp outlines and a sharp contrast between the black ink and white paper. Dürer used hatching, a series of parallel lines that vary in thickness and frequency, to create a mid-toned background for Christ’s divine halo. 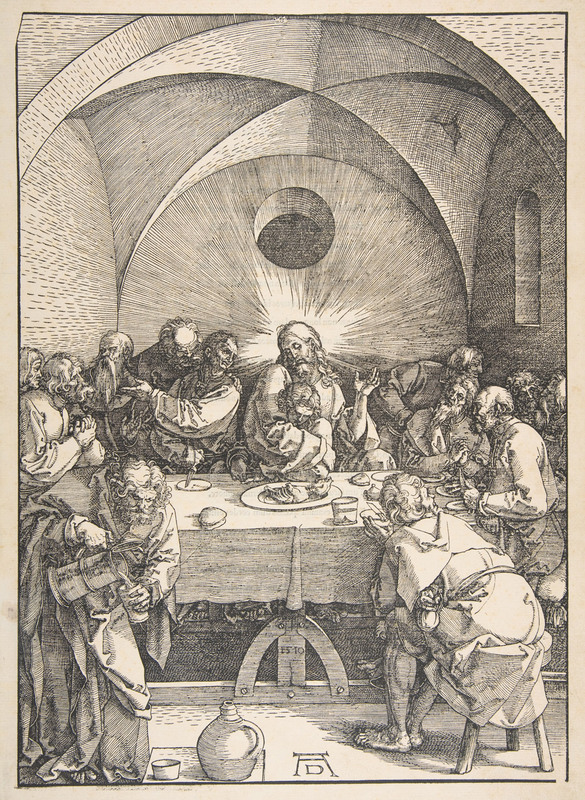 Images: The Last Supper, from The Large Passion, 1510, Albrecht Dürer, German, 1471–1528, woodcut, 17 5/16 × 12 1/16 in., Lent by The Metropolitan Museum of Art, The George Khuner Collection, Gift of Mrs. George Khuner, 1975 (1975.653.12). Illustrations: Time Marsden. This week on Graphic Content we discuss aquatint, another intaglio method of printmaking. This is a oft-used method of Goya’s in his Los Caprichos series. Speaking of . . . you’ve only got two more weeks to see 80 prints from the Los Caprichos series in Graphic Masters: Dürer, Rembrandt, Hogarth, Goya, Picasso, R. Crumb. This huge exhibition showcasing over 400 print works created across 500 years closes August 28. That means, you’ve got one more Press & Print: Drop-in Studio where you can experiment with the techniques you see in the exhibition. Also, coming up is the final My Favorite Things tour of the exhibition with Jessixa Bagley. A variation of the etching process, aquatint allows for areas of printed tone in order to achieve a more painterly effect. Instead of a uniformly brushed on ground, powdered rosin is dusted onto the plate until the desired coverage is achieved. The acid eats away the unprotected portions of the plate between the rosin particles, resulting in a rich, speckled effect. 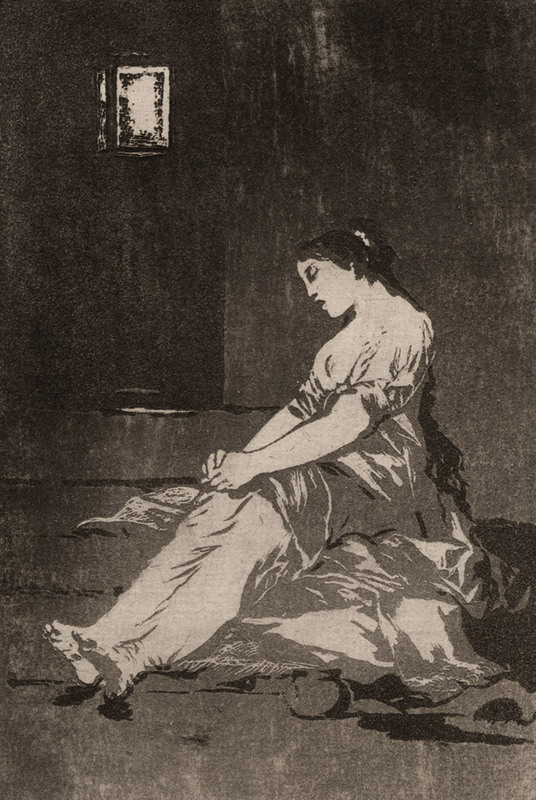 Goya used aquatint to create a dank, gloomy prison cell that mirrors the despair of this unfortunate young lady. IMAGES: Illustrations: Tim Marsden. Los Caprichos: Por que fue sensible. (Because she was susceptible. ), 1796–1797, Francisco Goya, Spanish, 1746–1828, aquatint, 8 7/16 × 6 in., Private Collection. Make something! We’re here to help with more than just artistic inspiration and influence. The Graphic Content blog series offers a weekly debrief on different types on printmaking and helps point out examples of them that you can find in Graphic Masters: Dürer, Rembrandt, Hogarth, Goya, Picasso, R. Crumb. August is the final month of Graphic Masters, which means you’ve only got three more Press & Print: Drop-In Studio events left to learn the printmaking techniques of the masters! Here’s your weekly primer on etching, a type of intaglio printing that Rembrandt uses in combination with drypoint in Christ Healing the Sick. Come to SAM and see. Instead of removing metal from the plate through force, etching uses a chemical process. The plate is prepared by brushing on a thin layer of waxy, acid-resistant covering called ground. The design is scratched through the ground, revealing the plate below. Compared to engraving, very little pressure is needed, allowing for fluid lines more akin to drawing. The entire plate is then submerged in acid, which etches, or bites, the exposed metal. Once the desired effect has been reached, the plate is removed from the acid bath and the ground cleaned off. It is then inked and printed through the same process as engraving. 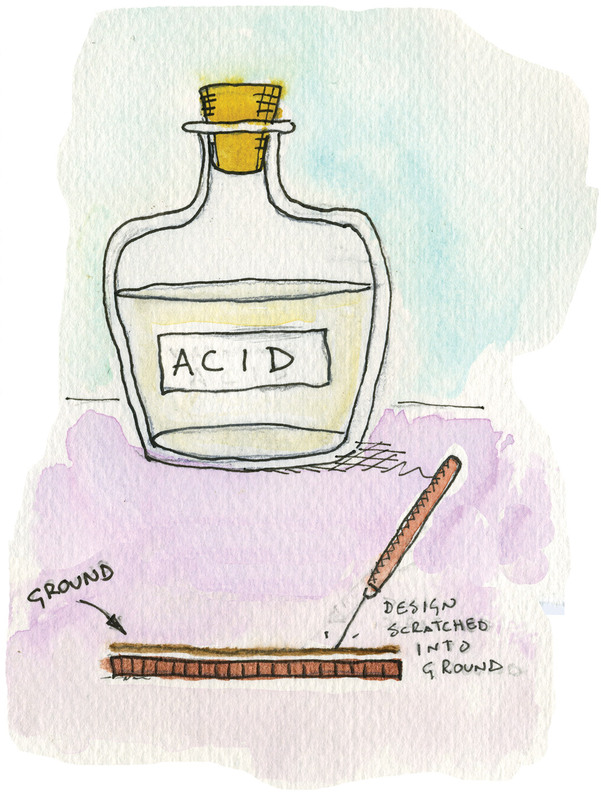 The depth of an etched line is determined by how long the plate is submerged in acid. To achieve dramatic tonal variations, Rembrandt removed the plate from the acid and applied more ground to protect the lighter areas before submerging the plate again—a process called stopping out. We continue to dig in to the printmaking on view in Graphic Masters: Dürer, Rembrandt, Hogarth, Goya, Picasso, R. Crumb with another technique requiring carving—drypoint, a type of intaglio printing. Last week we discussed engraving, a method that produces clean, smooth lines. Drypoint, on the other hand, produces a more textured and ephemeral effect offering delicate and subtle touches. Looking for a more hands-on learning experience? Check out our Press & Print: Drop-in Studio events taking place Sundays, 11 am–1 pm through August! Similar to engraving, drypoint requires the artist to carve directly into the plate surface. What distinguishes this technique is the way the drypoint needle displaces the copper to form burr—jagged furrows and curls of rough metal on the surface. The burr grabs and holds the ink, resulting in rich, fuzzy lines. Because repeated pressure from the printing process quickly wears down the burr, the effect is fleeting and early impressions are considered the finest and most sought after. Ink captured by the burr spreads out on the paper, resulting in caterpillar-like lines. In this etching, Rembrandt added touches of drypoint to accentuate the texture of the foliage. 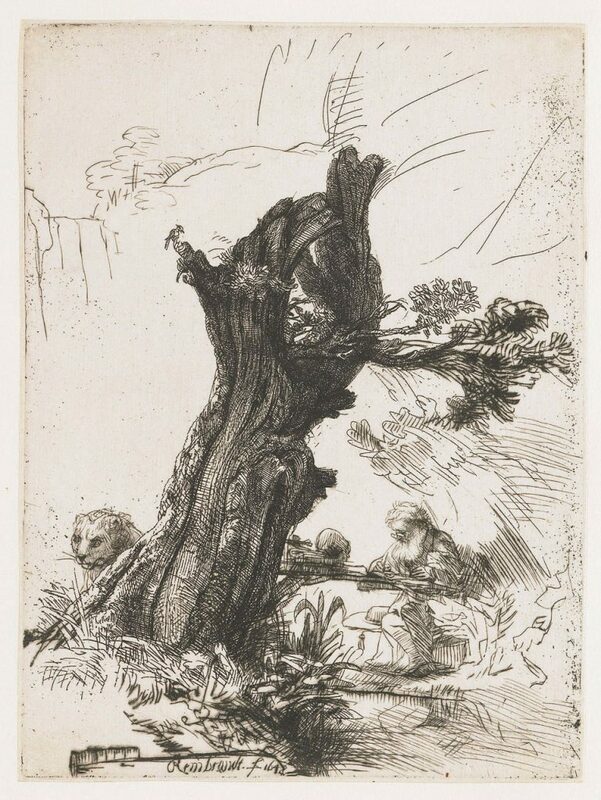 Saint Jerome Beside a Pollard Willow, 1648, Rembrandt van Rijn, Dutch, 1606–1669, etching and drypoint, 7 1/16 x 5 1/4 in., Seattle Art Museum, Gift of Dr. Leo Wallerstein, 53.186. Last week on Graphic Content, we introduced printmaking and the intaglio method. This week we discuss engraving, a type of intaglio, used by William Hogarth for his print series in Graphic Masters: Dürer, Rembrandt, Hogarth, Goya, Picasso, R. Crumb. Want to learn more? 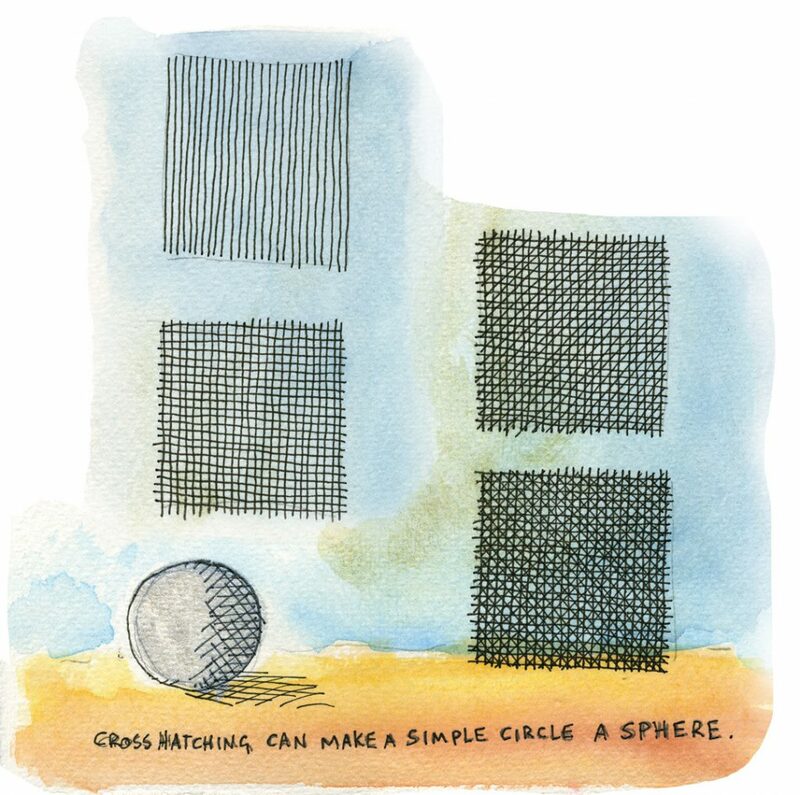 Study the effects of this method with a visit to SAM and get more tips on printmaking by working with local artists during Press & Print: Drop-In Studio. Check back weekly through the run of Graphic Masters for more information on different types of printmaking and get creative in and out of the museum. To make an engraving, the artist incises a design into the plate using a burin, a tool with a sharp diamond-shaped tip that creates smooth lines with crisp edges. Significant pressure and a steady hand are needed to force the burin into the plate and cleanly remove the excess copper from the surface. Because of the immense skill involved, some artists employed professional engravers to execute their designs. Whether calligraphic curves or stippled dots, engraved lines are clean and precise. 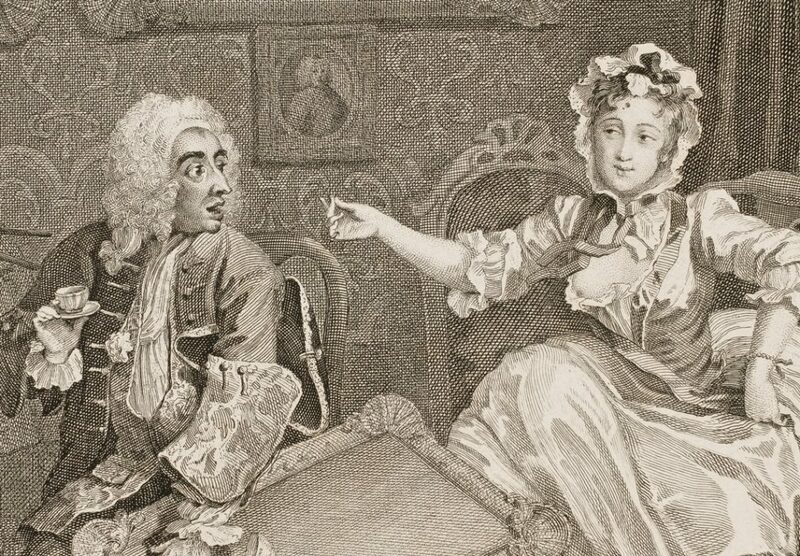 Hogarth employed cross-hatching, the angled intersection of hatched lines, to achieve a great range of textures and tones. 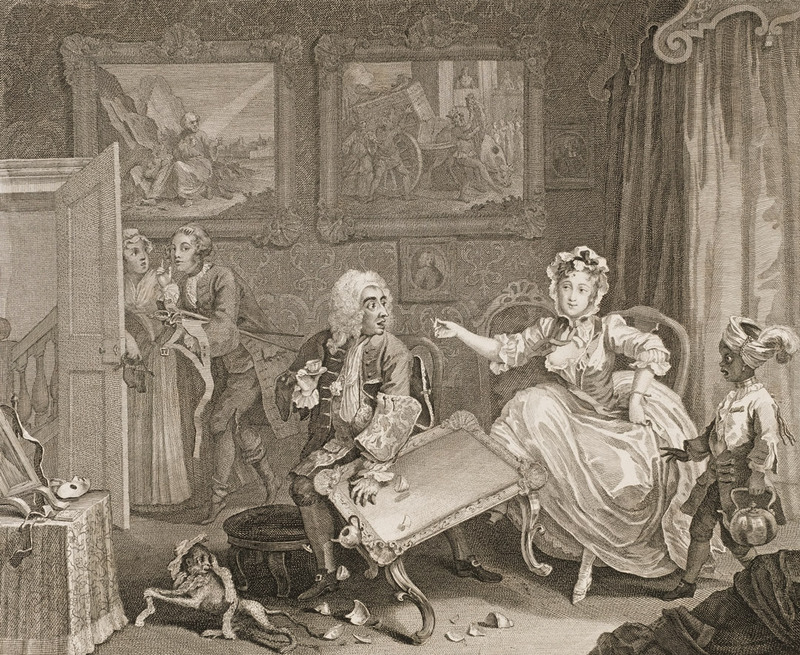 IMAGES: The Harlot Finds a Protector, 1732, William Hogarth, English, 1697–1764, engraving, 12 3/8 x 15 1/16 in., Seattle Art Museum. Gift of Lloyd Spencer, 44.298. Photo: Elizabeth Mann. Illustrations: Tim Marsden. The Harlot Finds a Protector (detail), 1732, William Hogarth. Graphic Content: What is a Print? Get a primer on the printmaking techniques of the masters in Graphic Masters: Dürer, Rembrandt, Hogarth, Goya, Picasso, R. Crumb. 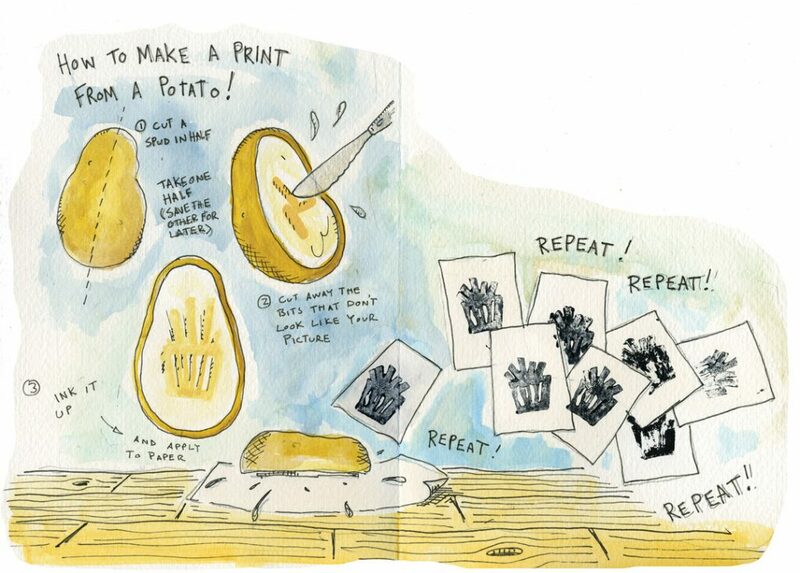 Try making your own prints at home after you’ve been inspired by your visit to SAM, or check out our Press & Print: Drop-In Studio sessions while at you’re at the museum and put these tips into practice with the guidance of local artists. At its most basic, a print is a work of art on paper that’s produced in multiples from an inked surface. 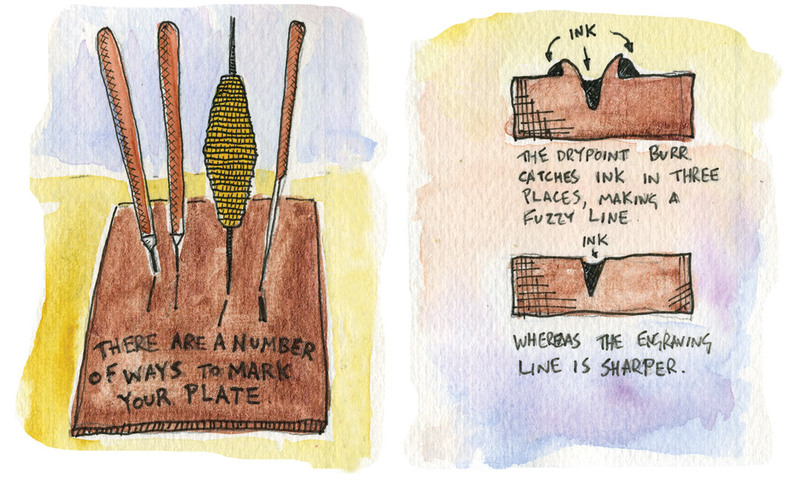 While various types of printmaking exist, the basic components are the same—an inked wood block or plate, a sheet of paper, and a press that transfers the ink to the paper. The process is repeated many times, resulting in multiple impressions of the same image. Voila, a print edition! Following the invention of the printing press in the 15th century, printmaking gained popularity as an inexpensive way to disseminate visual information to a mass audience. Early prints—typically illustrations in books or reproductions of famous paintings—tended to be relatively small, affordable, and easily transportable. While fine paintings by important artists were too expensive for most people, prints were within reach. Prints did not remain purely illustrative for long. Printmaking came to be seen as a distinct mode of expression capable of producing works of fine art. Artists like Albrecht Dürer established a tradition of virtuoso printmaking. His episodic handling of narrative through print series, like The Large Passion, laid the groundwork for later generations of graphic artists from William Hogarth to R. Crumb. The technical innovations of artists like Rembrandt van Rijn and Francisco Goya pushed the boundaries of the medium and further elevated printmaking as an art form. Connoisseurs began to build collections of particularly fine impressions. 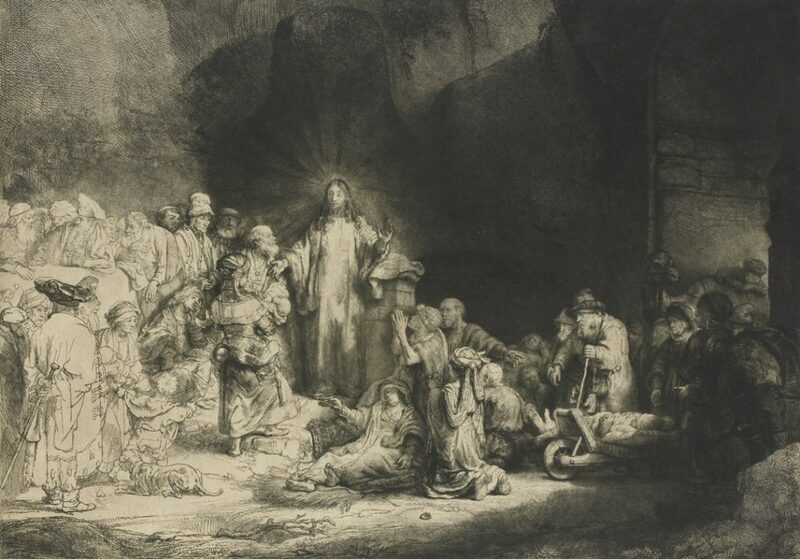 Rembrandt’s Christ Healing the Sick was so sought after that it fetched prices usually associated with oil paintings, earning it the nickname “The Hundred Guilder Print.” But in general, prints remained accessible works of art meant to be viewed and appreciated up close. Intaglio (Italian for “carving”) is the opposite of relief. A linear design is carved into the surface of a polished metal plate, usually copper. Ink is worked into the entire plate and then the surface is wiped clean, leaving ink only in the recessed grooves and pits. As the printing process wears down the plate, the artist can rework the design to pull more impressions. Altering the plate surface results in a new version, or state. Some artists, Rembrandt in particular, used this opportunity to make dramatic changes to their compositions. 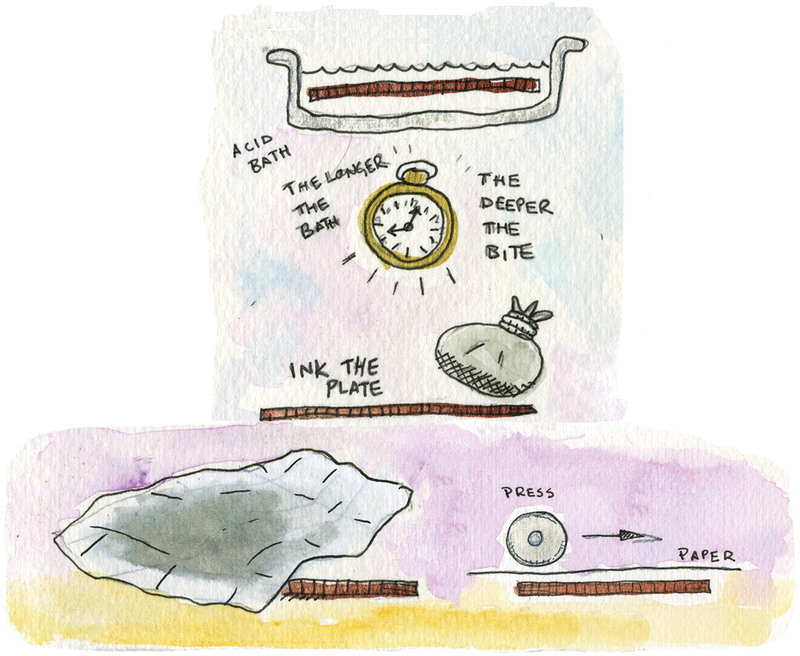 There are several types of intaglio printing: engraving, drypoint, etching, and aquatint. 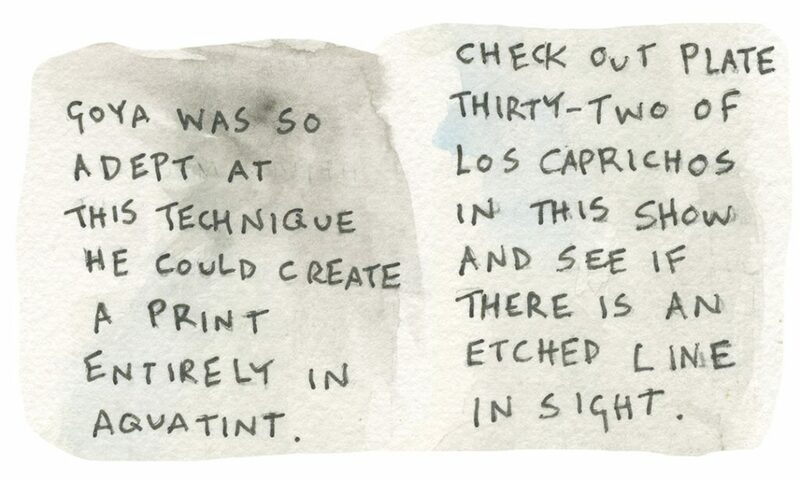 Artists may use just one technique at a time or a combination of several in a single print. We’ll cover each type of intaglio printing in the weeks to come, stay tuned! IMAGES: Illustrations: Tim Marsden. Christ Healing the Sick (The Hundred Guilder Print), 1643, Rembrandt van Rijn, Dutch, 1606–1669, etching and drypoint, 11 1/8 × 15 1/4 in., Private Collection. 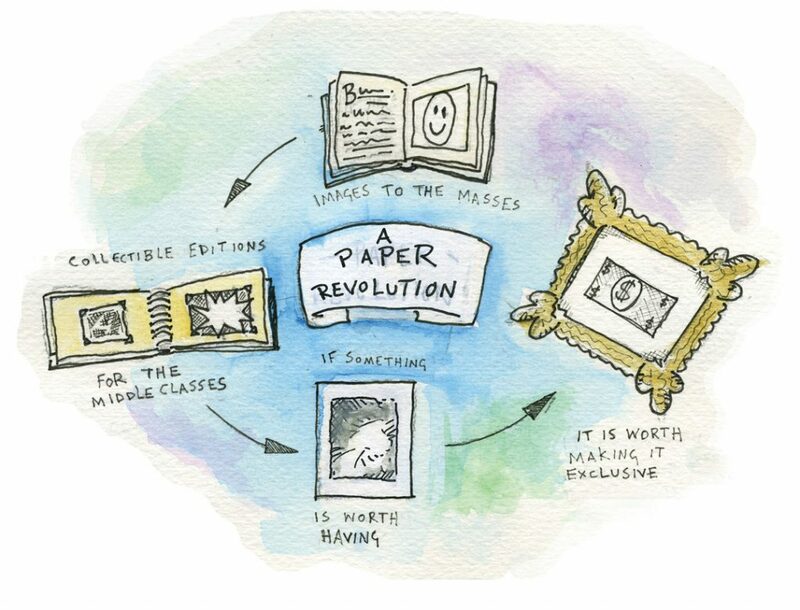 What does the word “printmaking” mean in our digital age? 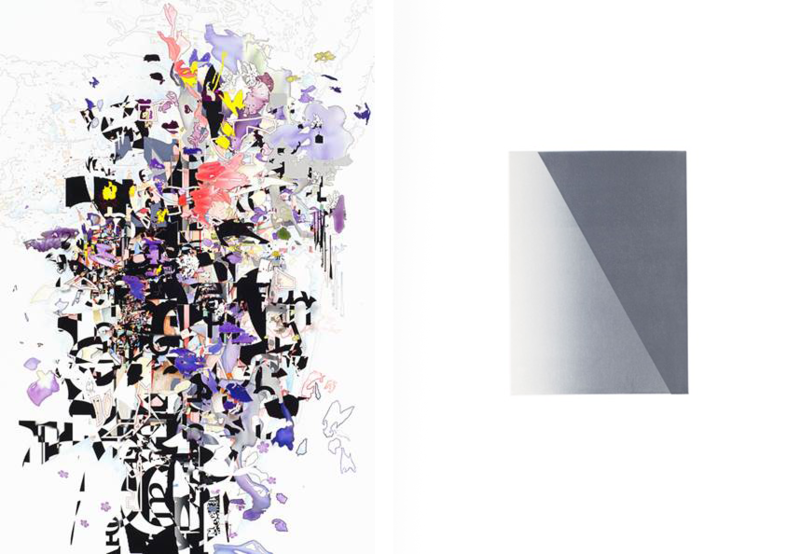 SAM Gallery’s June show, Contemporary Printmakers, supplies answers as varied as the artwork on view. From the digital images of Stephen Rock and Troy Gua, to the mélange of techniques used by Kate Sweeney and Iskra Johnson, these artists use printmaking for many reasons. On the practical side, Gua says collector demand led him from painting to digital mediums. 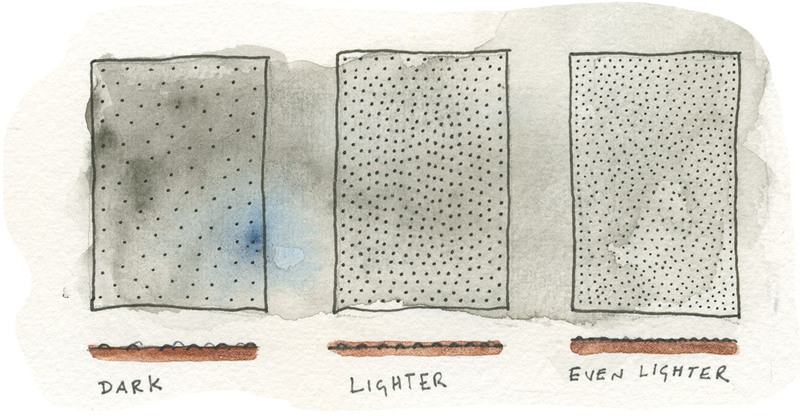 Meanwhile, Kate Sweeney’s desire is to push a two-dimensional surface into revealing three-dimensional space. Printmaking, simplified, is when an artist works on one surface and then applies or transfers that work to a different surface. 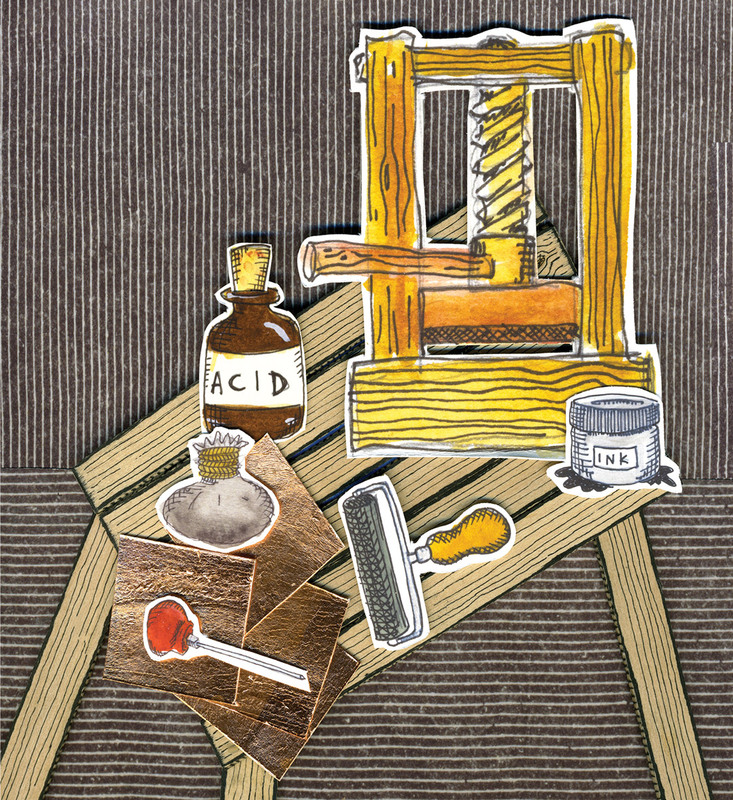 You’re probably familiar with how a wood block, an acrylic stamp, or a metal plate can be pressed onto a sheet of paper—this is printmaking. The idea of the repeatable image, or part of an image, has held appeal as a way to reprise elements of an artwork for artists and art collectors for millennia. Think of Andy Warhol and how his repeated gestures are fundamental to understanding the work as well as the artist’s intent. 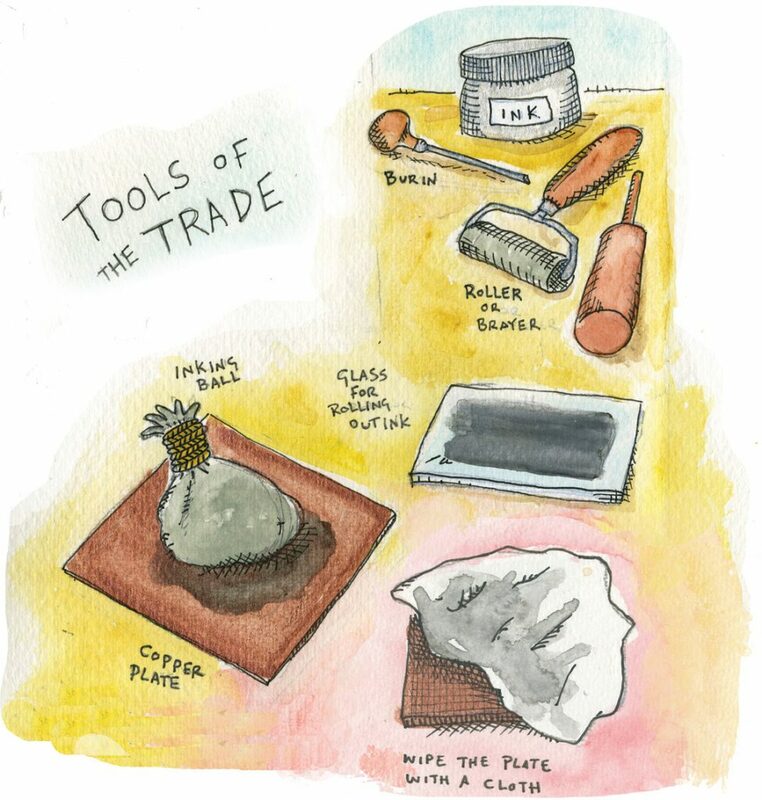 Today’s printmakers come to the medium for similar reasons but their toolkit includes computers, cameras, traditional print presses, handmade “pressure” prints, photocopies, and just about anything else that can be scratched and used to make marks on a surface. 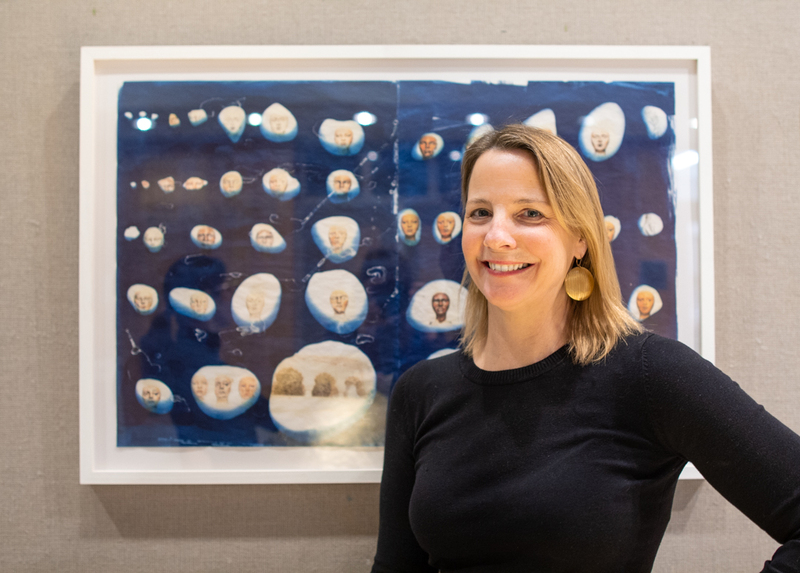 Whether it is the psychedelia of color explosions in Gua, Sweeney, and Rock’s work; or the whisper of minimalism in Rachel Illingworth’s pieces, the printmaking process helps artists tell their story in a multitude of ways. Johnson says it best: “the process forces a certain surrender of control . . . with work that appears to have ‘arrived’ rather than having been ‘made’.” Her current body of work revolves around the theme of impermanence. Sweeney is contemplating gravity waves, dark matter, and all things quantum-theory related. And although 20th-century artist Agnes Martin didn’t work extensively with prints, it’s easy to see that she is a favorite of Illingworth’s. Gua wants to pay homage to the beautiful imagery and composition of Japanese woodblock prints, but also Northwestern-ize his work by using familiar landmarks. Artist Curt Labitzke, a University of Washington Art Department Professor who runs the print studio there says his work in this show isn’t a print, but rather a painting. However, he used techniques to bring scratched elements through the back of the paper surface. So is it a print, based on the definition above? SAM Gallery invites you to see this show and decide for yourself. The show runs June 9–July 7 and features the work of Northwest artists Troy Gua, Rachel Illingworth, Iskra Johnson, Curt Labitzke, Stephen Rock, and Kate Sweeney. SAM Gallery is located in the lower level of Seattle Art Museum’s downtown location and open the same hours as the museum. All of the artwork is for sale and members can try before they buy, with a low-cost art-rental program. Images: Somerset (Cathedral), Troy Gua, resin coated metallic chromogenic print on panel, 30 x 48 in. 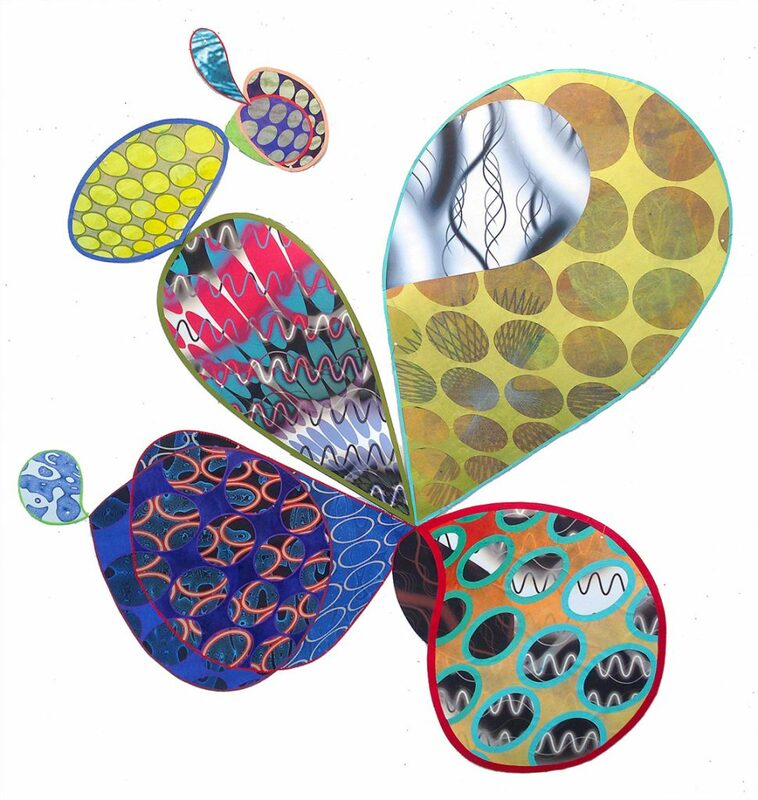 Luck or Chance: Many universes are possible, simultaneous and interpenetrated, Kate Sweeney, acrylic on paper collage with digital print, monoprint, braille print and transfer print, 46 x 49 in. View Corridor, Iskra Johnson, archival pigment print, 33 x 61 in. When Flowers Speak to Clouds, Stephen Rock, pigmented print with watercolor, mounted on board, 36 x 24 in. From the Terrace (A Study of Edges) No. 6, Rachel Illingworth, monotype with Pochoir, 40 x 31 in.